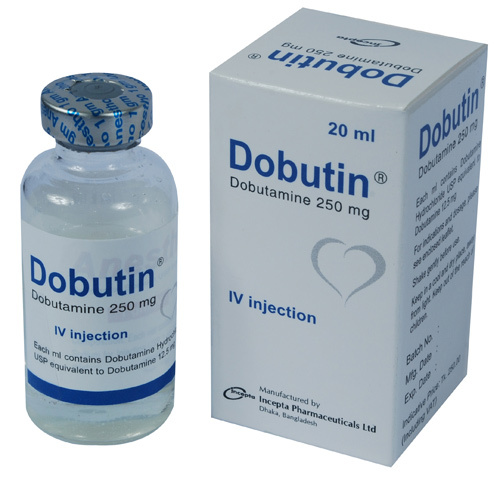 Dobutin : Each vial contains 20 ml solution of Dobutamine Hydrochloride USP 0.2802 gm eq. to Dobutamine 250 mg.
Dobutamine Hydrochloride is a direct-acting inotropic agent whose primary activity results from stimulation of cardiac adrenergic receptors; it produces comparatively mild chronotropic, hypertensive, arrhythmogenic and vasodilatory effects. In contrast with dopamine, it does not release norepinephrine and its actions are not dependent on norepinephrine stores in the heart. In humans, Dobutamine Hydrochloride increases stroke volume and cardiac output and decreases ventricular filling pressure and total systemic and pulmonary vascular resistances. Dobutamine Hydrochloride is indicated when inotropic support is necessary for the treatment of patients with hypoperfusion states in whom cardiac output is insufficient to meet circulatory demands. Dobutamine Hydrochloride is also indicated when inotropic support is required for the treatment of patients in whom abnormally increased ventricular filling pressures introduce the risk of pulmonary congestion and oedema. Because of its short half-life, Dobutamine Hydrochloride must be administered as a continuous intravenous infusion. Following the initiation of a constant rate infusion, or upon changing the rate, a steady-state dobutamine plasma concentration is achieved within approximately 10 minutes. Thus, loading doses or bolus injections are not necessary and are not recommended. The rate of infusion needed to increase cardiac output has ranged from 2.5 to 10 mcg/kg/min in the majority of patients. Frequently, doses up to 20 mcg/kg/min are required for adequate haemodynamic improvement. On rare occasions, infusion rates up to 40 mcg/kg/min have been reported. The rate of administration and the duration of therapy should be adjusted according to the patient's response, The indicators are: haemodynamic parameters such as heart rate and rhythm, arterial pressure, and, whenever possible, cardiac output and measurements of ventricular filling pressures and signs of pulmonary congestion. Concentrations up to 5,000 mg/L have been administered to humans. The final volume administered should be determined by the fluid requirements of the patient. Rather than abruptly discontinuing therapy with Dobutamine Hydrochloride, it is often advisable to decrease the dosage gradually. The rates of fluid infusion that are required to deliver specific dosages are a function of the concentration of Dobutamine Hydrochloride in the infusate. The following table provides a guideline of infusion rates (mL/kg/min) required for 3 frequently used concentrations of Dobutamine Hydrochloride (250, 500, and 1000 mg/L). Dobutin Injection when diluted to 250 micrograms/mL and 500 micrograms/mL with 0.9% Sodium Chloride Injection and 5% Glucose Injection, was found to be stable for 24 hours at room temperature and in the presence of fluorescent light. During the administration of Dobutamine Hydrochloride, as with any parenteral catecholamine, heart rate and rhythm, arterial blood pressure, and infusion rate should be monitored closely. When initiating therapy, electrocardiographic monitoring is advisable until a stable response is achieved. Since there are no adequate and well-controlled studies in pregnant women, Dobutamine Hydrochloride should not be used during pregnancy unless the potential benefits outweigh the potential risks to the foetus. It is not known whether this medicine is excreted in human milk. Because many medicines are excreted in human milk, caution should be exercised when Dobutamine Hydrochloride is administered to a nursing woman. If a mother requires dobutamine treatment, breastfeeding should be discontinued for the duration of the treatment.